Salad Recipes Easy salad recipes to make for a picnic, potluck, or meal. Includes vegetarian meals and many more. Dessert Recipes Dessert recipes, many from the garden! Delicious desserts featuring herbs, spices, fruits and more. Why Didn’t My Lettuce Seeds Sprout? Are you interested in backyard vegetable gardening? I thought readers would enjoy a brief video tour of my garden and some tips on starting your organic vegetable garden this year. I’ve been fascinated by flint corn this month. What is flint corn? It’s what we called Indian corn as a children – the brightly colored corn used as fall decoration. Jeanne Grunert is a freelance writer, novelist, and compassionate lifestyle advocate dedicated to inspiring people to act with kindness, creativity, and gentleness. In 2007, Jeanne did what her family and friends said was impossible. She quit her job as the marketing director for a global publisher, sold her family’s Long Island home, and moved to Virginia to live on a 17-acre timber farm and grow a life rather than make a living. Since this leap of faith, Jeanne founded Seven Oaks Consulting, her writing and marketing services firm, and launched Symponia – the Compassion Project. 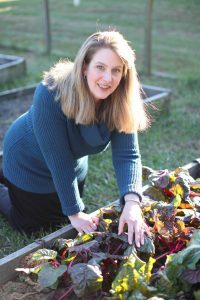 She became a certified Master Gardener and the “Ask the Expert” columnist for Virginia Gardener magazine. But perhaps what Jeanne is most proud of is publishing her first novel, I Believe You, and several novellas and a collection of short stories. When Jeanne isn’t writing, you can find her tending her organic garden, walking or hiking in the Blue Ridge Mountains, experimenting with vegetarian meals, and caring for her many rescued pets. She lives with her husband, John, at Seven Oaks Farm in central Virginia. Writer Jeanne Grunert in her garden at Seven Oaks Farm. 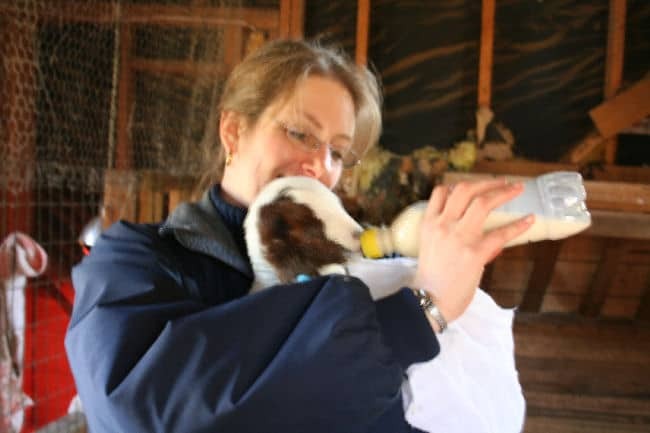 Bottle feeding a neighbor’s kids – literally, baby goats – here in Virginia. Home Garden Joy started in 2007 as Seven Oaks, a blog about moving from New York City to rural Virginia. At first, I wrote about new experiences: rising at dawn to watch a meteor shower, growing sweet potatoes for the first time, my neighbor using his shotgun to shoot mistletoe out of an oak tree (he really did). I began answering gardening questions and sharing more how-to articles. In 2014, I moved the blog to its current home, renamed it, and rebranded it to become Home Garden Joy. It’s now dedicated to sharing my passion for all things plants and gardening, delicious recipes to help you cook what you grow, and staying healthy through herbs and a plant-based diet. Speaking of plant-based diets, I spun off some of my healthy living content into Planet Plant Foods. This blog focuses more on how my family transitions from a typical American diet to a plant-based, nutritarian diet that focuses on greens, beans, onions/garlic, mushrooms, berries and seeds, all fresh vegetables and fruit, and minimally processed foods. It’s been fun sharing my meals there, as well as my discoveries in the world of health and wellness. You can learn more about my fiction and my passion project, Symponia – the Compassion Project, at Writer Jeanne Grunert. And lastly, if you enjoy my writing and would like to hire me to write for your company website, blog or publication, please visit my business, Seven Oaks Consulting (The Marketing Writer). I am a full-time freelance writer. Contact me using this link – please feel free to contact me about sponsorship opportunities or writing for your blog or website. I do not accept outside submissions to my websites or blogs since they showcase my writing for potential readers and clients. Thank you for your understanding. Welcome to Home Garden Joy! My name is Jeanne, and in 2007, I did what my family and friends said was crazy. I quit my successful job as a New York City marketing executive and moved my entire family to a 17-acre farm in the middle of rural Virginia. Today, I grow a life instead of just making a living. I’m a full-time freelance writer, gardener, nutritarian and compassionate lifestyle advocate. Learn more About Me. The ONLY weeding tool I recommend - the CobraHead weeder. Learn more about this time-saving tool. Home Garden Joy is a participant in the Amazon Services LLC Associates Program, an affiliate advertising program designed to provide a means for sites to earn advertising fees by advertising and linking to Amazon.com. Home Garden Joy participates in numerous affiliate programs including Rakuten Linkshare and Affiliatly. When you click on a post, image, or link that has an affiliate code in it and purchase something from the website, I make a small commission. This does not affect your cost in any way.